Trump's Transition Team Cites Discredited Reports As Evidence Of Voter Fraud The Trump transition team pointed to one heavily criticized study, as well as an analysis that didn't count fraud, as evidence that "millions of people" voted illegally. Republican presidential candidate Donald Trump looks at his wife, Melania, as they cast their votes at P.S. 59 in New York on Election Day. Consider it another Trump flip-flop: back in October, Donald Trump told a crowd, "I will totally accept the results of this great and historic presidential election, if I win." Trump went on to decisively win the Electoral College, but now he is questioning the results anyway. In a tweet this weekend, the president-elect alleged — providing zero evidence — that "millions of people" voted illegally, and that that's the reason Hillary Clinton won the popular vote. On a Monday morning phone call, members of the Trump team tried to back up the claim when NPR's Tamara Keith asked them for corroborating evidence. However, nothing they cited really made that case. "In particular, I'd point to the 2014 Washington Post study that indicated more than 14 percent of non-citizens in both in 2008 and in 2010 elections indicated they were registered to vote. ... Some numbers include the Pew Research study that said that approximately 24 million, or one out of every eight voter registrations in the United States[,] are no longer valid or significantly inaccurate. And in that same Pew Research study, the fact that 2.75 million people have registrations in more than one state. So all of these are studies and examples of where there have been issues of both voter fraud and illegal immigrants voting. ..."
First, there is the "Washington Post study" that Miller cites. He was referring to a 2014 post from the Monkey Cage, a political science blog at the Post. In that piece, Old Dominion University professors Jesse Richman and David Earnest wrote about a study they conducted of data from the Cooperative Congressional Election Study, an operation that conducts ongoing surveys of voters. Richman and Earnest indeed found that "14 percent of non-citizens in both the 2008 and 2010 samples" they used said they were registered to vote. Not only that, but some of those respondents said they in fact did vote. "Note: The post occasioned three rebuttals (here, here, and here) as well as a response from the authors. Subsequently, another peer-reviewed article argued that the findings reported in this post (and affiliated article) were biased and that the authors' data do not provide evidence of non-citizen voting in U.S. elections." That peer-reviewed article comes from a team of researchers that includes Stephen Ansolabehere, who developed the CCES. He and two colleagues wrote at the Monkey Cage that Richman and Earnest's findings were based on "measurement error." For example, 56 respondents (a tiny sliver of people) changed their citizenship status between 2010 and 2012, and 20 of those had changed from citizen to noncitizen. That's "highly unrealistic," Ansolabehere and his colleagues wrote. "The mistake that Richman and his colleagues made was to isolate this small portion of the sample and extrapolate from it as if it were representative of some larger population," they added. Later on, the Washington Post's Fact Checker likewise gave this claim (when made by Eric Trump) four Pinocchios. That's one piece of evidence Miller put forward. He also pointed to a 2012 study from the Pew Charitable Trusts. The numbers he cites are in fact correct: That study showed that 24 million voter registrations at the time were "no longer valid" or were "significantly inaccurate," and that nearly 2.8 million Americans were registered in more than one state. One reason it's hard to keep registrations up to date is that each state has its own system, plus safeguards to make sure people don't inadvertently get unregistered. "We have these 50 different systems and different databases on voter registration," said Lorraine Minnite, a professor of political science at Rutgers University and author of The Voter Fraud Myth. "And we have a federal law that was passed in 1993 to protect voters from being illegally purged from registration lists for political reasons." That 1993 law is the National Voter Registration Act, and it sets out specific provisions under which a state can remove a person from the voter rolls. Because of those provisions, a person won't instantaneously be removed after moving to a different state or dying, for example. Getting a driver's license in another state could cancel a person's registration in the original state, but both states first have to communicate with each other. "So what has happened is that this notion that voter registration lists can possibly be 100 percent accurate at any point in time is a complete fiction," she said. "It's not allowed under federal law to be that way." So Trump in fact — however inadvertently — did draw some attention to what many consider a real problem. "If you lined up people from all political angles, they would agree that we in the country have a lot of room to grow on that, and that voters and election officials would be better off if we made common-sense reforms to voter registration," said Myrna Pérez, leader of the Voting Rights and Elections project at the Brennan Center for Justice. But she takes issue with his allegations. "The answer is not to create panic and to make allegations that undermine confidence in our elections," she said. 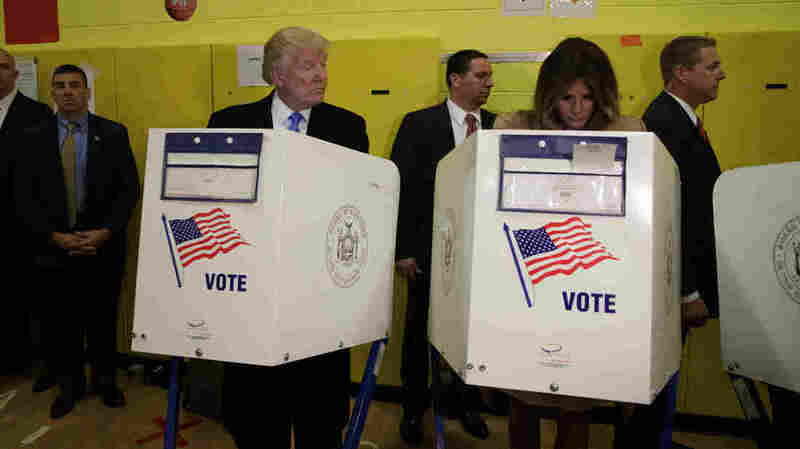 Donald Trump and his team have repeatedly alleged voter fraud in this election, alleging that the outcome would be "rigged." "We do have some instances of voter fraud. The most common kind of voter fraud we see [is] usually in a local election where maybe dozens or 100 ballots could make a difference, involving absentee ballots. Usually, it's absentee ballots that are bought or sold. I'll give you $20 for your absentee ballot and then I can vote it the way I want. Unlike impersonation fraud, when it's an absentee ballot, you can verify how someone voted because you have the actual ballot, so that does happen. "And for The Voting Wars, I was able to find regularly in local elections — and certainly in some parts of the country there's been an unfortunate history of this, in parts of Kentucky, South Texas, parts of Florida. We have had this kind of fraud. But it's been in small local elections, never on a large enough scale, I think, to affect a presidential election and not the kind of fraud that Donald Trump is talking about to affect the outcome [emphasis added]." Unfortunately, it's often possible to find some sort of instance of shady-looking behavior in any given election. The Trump campaign provided NPR with a 45-page document listing instances of voter fraud, intimidation, and registration fraud (some of which are only listed as alleged instances), going back more than a decade. Clarification: This article was clarified on Nov. 28 to show that some of the instances the Trump campaign listed to NPR were allegations and not necessarily proven to be true.